What's so SUPER about Super Bowl? If you’re all hyped up about Super Bowl Sunday, this might make you cry. 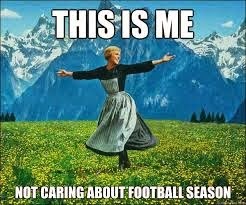 I just can’t get excited about football, or any sports, for that matter. I’ve tried. But once they extended all the various seasons to overlap and run continually for 12 months, they lost me. The other day I overheard some friends discussing the Seahawks VS Packers game and I asked if the Hawks is a hockey team. The looks of horror on their faces made me slink away like a wounded puppy. Let’s face it, the Super Bowl broadcasts just don’t muster up to the good old days. I remember the annual bashes where the men were glued in front of the TV and the women were in another room solving the world’s fashion crisis while sucking down cocktails. My kind of sports viewing. And how about those halftime extravaganzas? There hasn’t been any excitement in those shows since the infamous “wardrobe malfunction”. Now, it’s just, “ya seen one rock band ya seen ‘em all”. I heard Katy Perry is performing this year…big whoop! I’m sure all the teeny boppers will be mesmerized. Truth be told, I will admit to poking my head into the room when the commercials come on. Who can resist those darling Clydesdales? It still brings a tear to my eye every time I hear the “Rocky” theme. The rest of the them, however, seem to have gone to hell-in-a-hand-basket. I think I read somewhere that only 14 people watched the follow-up program "Super Bowl's Greatest Commercials". We are not surprised. Thought I’d do a little digging to find out what we can expect to see this year for $4+ million a pop, and I have some good news and bad news. The good news for the ladies—most of the car ads will be kaput, and most of the “offensive to female” ads are a thing of the past. 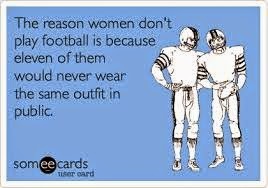 Even the Victoria Secrets models will appear in football uniforms instead of scanty undies. But don’t worry, men. The good news—Carl’s Jr. will still feature a seemingly naked Charlotte McKinney in perhaps one of the raciest and most juvenile Super Bowl ads ever. A little something for everyone! So, sports fans, enjoy your day munching on Doritos and Queso dip and cheering your little hearts out. As for those of us who have little interest, all I can say is, “Thank heaven for DVRs”!! !